A creative textile and surface design show, named Indigo features top level design studios, trend studios and bookshops. Below are their textile colors for the season. Byoyant: Modern technology offers us the opportunity to remain connected with others, not alienated or alone. Perhaps because of this and despite the continuing struggles with the economy, climate change and other challenges to our survival, we remain optimistic about the future. 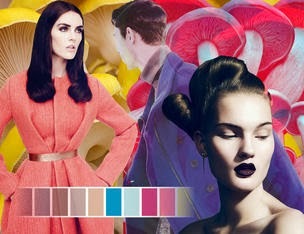 That optimism is reflected in a palette of unexpectedly light and bright shades of color offset with tinted neutrals. Garment shapes, particularly outerwear, grow in volume but in featherweight fabrics, offering a protective shell that is still light and easy to wear. Romany: This theme alludes to the romance and history of the traveling people of Old Europe. Color inspiration comes from their brightly painted caravans and the rich hues of their embroidered textiles. Intense shades of red and orange mix with a variety of blues and greens. Charcoal grey, navy blue and pale yellow, offset the brights. This palette works well for prints and patterns on both woven sans sweater knits. Chiaruscuro: Inspired by the art form, with its use of strong contrasts between light and dark. 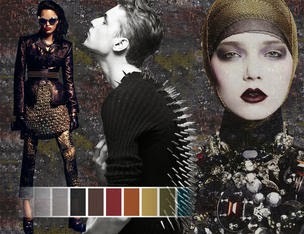 It also alludes to the fairy tales we learned as children, dark and magical stories with extreme characterizations including the pure heroine, the valiant prices and the wicked witch influence a palette of stark black and white with shadowy grey hues. Metallic shades of copper and old gold speak to a medieval timbre and are used in combination with deep red and teal blue.